The Union County Sheriff’s Office has taught the D.A.R.E. (Drug Abuse Resistance Education) program for twelve years, in five county schools. More than 1200 fifth and sixth grade students have benefited from this program. D.A.R.E. 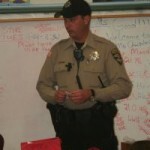 is a collaborative effort by DARE certified law enforcement officers, educators, students, parents and the community. The aim of the educational program is to prevent or reduce drug abuse and violence among children and youth. The emphasis is to help students recognize and resist the many direct and subtle pressures that influence them to experiment with alcohol, tobacco, marijuana, inhalants, or other drugs or to engage in violence. The DARE program offers preventive strategies to enhance those protective factors-especially bonding to the family, school, and community-which appear to foster the development of resiliency in young people who may be at risk for substance abuse or other problem behaviors. 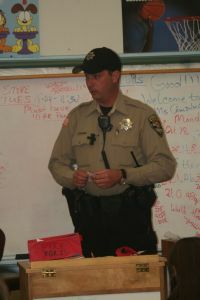 The program content for DARE is organized into seventeen lessons taught by Deputy Tony Humphries, with suggested extended activities to be integrated into other instruction by the classroom teacher. DARE offers a variety of interactive, group-participation, cooperative-learning activities which are designed to encourage students to solve problems of major importance in their lives. The Dare Officers have undergone two weeks of intensive DARE training, along with periodic updates.